Dr. Robert Pickering is a board-certified pulmonologist at the Fayette County Memorial Hospital. Pulmonary physician Robert Pickering says there’s quite a bit of lung disease in Fayette County. “We do like our tobacco here. They’re well above the national average for tobacco use for smoking, which of course leads to the COPD component,” said Dr. Pickering. As a lung doctor, he sees patients at Fayette County Memorial Hospital who suffer with COPD (chronic obstructive pulmonary disease), a chronic, progressive disease that makes it more difficult to breathe as it advances. It’s a leading cause of death in the United States, with the Centers for Disease Control reporting 174,101 people died from chronic respiratory disease in 2014. “That’s something we’re really needing to do more on, as far as smoking cessation programs and such, but it’s very hard to get started. Nobody pays for the counseling. It’s a very difficult thing when it comes out of the cost of the patient,” said Dr. Pickering. In 1991, Dr. Pickering began his medical practice in Columbus, working primarily with the Mt. Carmel system. He periodically came to Fayette County, and after 20 years of working full-time in Columbus, decided to move to Fayette County, where he has been a full-time pulmonologist at FCMH for six years now. Dr. Pickering’s practice in lung medicine allows him to serve people with lung concerns across Fayette County: he manages the sleep lab at Fayette County Memorial Hospital, visits patients at the local nursing homes, gives consultations with patients in intensive care, interprets pulmonary function tests (PFTs) at the hospital and works as the medical director for YUSA. “Pulmonology is strictly lung medicine so anything that relates to the lung. The main things that we see are COPD’ers, smokers, asthma patients, abnormal chest x-rays and CT scans with spots for scars. We deal with lung cancer as far as making the diagnosis and counseling. We don’t do the treatments,” said Dr. Pickering. That’s primarily the lung part of things, said Dr. Pickering. Lungs and sleep might not seem like two things that go together, but for Dr. Pickering, there’s a connection. “And then the second thing of what lung docs do is the sleep lab. We run the sleep lab which is a two-bed unit,” said Dr. Pickering. In the sleep studies, patients come into the sleep lab at 8 p.m. and spend the night. Dr. Pickering said they can work with patients to develop solutions to their sleeping issues. Sometimes, it’s as simple as counseling people in proper sleep hygiene. “Poor sleep hygiene can cause hypertension and dementia,” said Dr. Pickering. The less a person sleeps, the faster their brain ages and the higher their risk is for developing heart disease. Dr. Pickering said it’s a good idea to get into a routine with going to sleep at the same time each night. Difficulty sleeping, chronic cough, shortness of breath with exertion, or “anything that is stopping them from doing what they want to do,” Dr. Pickering said, could be a sign that they need to have their lungs checked. “I would recommend that most people see their primary doc or primary provider first and then they can come and see me,” said Dr. Pickering. https://www.recordherald.com/wp-content/uploads/sites/27/2017/02/web1_thumbnail_Dr.-Pickering.jpgDr. 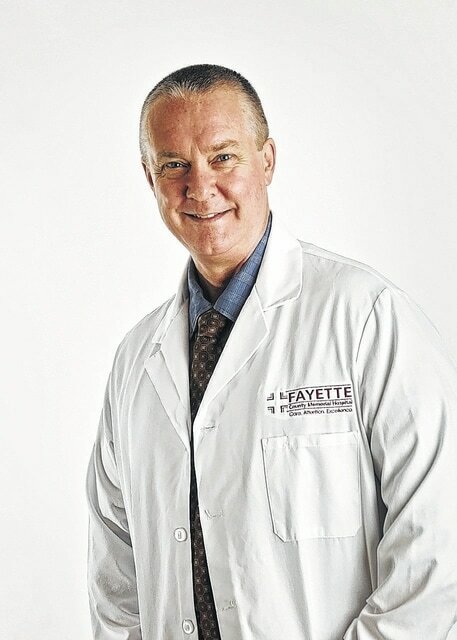 Robert Pickering is a board-certified pulmonologist at the Fayette County Memorial Hospital.